In times of technological change, expanding into new markets and growing revenue is crucial. 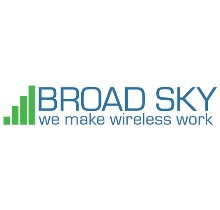 That's why we developed the Broad Sky Networks Partner Program – to give you greater access to the most innovative wireless technology solutions than ever before, all from a single trusted source. A partnership with Broad Sky means you'll immediately be able to sell the best M2M and Internet of Things (IoT) solutions for primary and business continuity. Not only that, but you earn the trust of your customers by leveraging our unparalleled expertise and widely-recognized status as an industry leader. By joining our Partner Program, you'll offer customers innovative, forward-thinking solutions. HIGHLY COMPETITIVE COMPENSATION: We've improved our payouts to make them even more competitive and are the only wireless partner offering Evergreen commissions to qualified Master Agencies and VAR's. Why make a one-time spiff when you can make double digit commissions for the life of the client? Our veteran staff and dedicated support team is ready to help you solve problems and close more deals. We offer sales and engineering support from our team of experts to engineer the most robust and secure wireless solutions meeting any customers' security demands. We've simplified processes of service checks, sales engineering support for the best and most cost effective solution, quote preparation, and equipment configuration. Along with all this, we also offer professional installations from our exclusive field service partner, TechLink Services www.TechLinkSVC.net. The biggest hurdle is getting your clients to commit to making a huge CAPEX spend to order services. Broad Sky has solved this problem by bundling the equipment and most upfront expenses into the monthly service cost for multi-year contracts. Your clients find it easier than ever to monitor or provide redundancy to every site they manage to insure 100% up time of their Voice, Data and Cloud services. Seven hardware vendors - Cradlepoint –Sierra Wireless –Cisco –Option –Monnit –MultiTech –Encore Networks and many specialty sensor and antenna partners as well. Six Wireless Carriers serving the US and Canada with multiple contracts to meet clients' data requirements.